At first glance, the mountain of recyclable materials at the city of Santa Cruz Resource Recovery Facility doesn’t look that much different from trash. And that’s a problem — not just for Santa Cruz, but for all recycling facilities coping with contamination. On a recent tour, city recycling assistant Leslie O’Malley picked a garden hose out of the looming 14-foot-tall heap and threw it aside, also pointing out other items mixed into the huge pile that shouldn’t be there — shredded paper, pieces of carpet, and Styrofoam, just to name a few. There are also the “tanglers,” like plastic bags and box strapping, which can get caught in the recycling machinery and bring everything to a grinding halt. Likewise with rigid plastic containers, produce clamshells, and a host of other items that make their way into mixed material recycling bins on a daily basis. And then there’s the out-and-out garbage mingled with the recyclables — two especially troublesome items are diapers and hypodermic needles. “Needles — how can they grab them?” said O’Malley, nodding in the direction of the Hope Services employees who sort the recyclables. Getting needles off the conveyor belt is tricky, since workers don’t want to get poked with something that could carry infection. And yet hypodermic needles have no place in the scheme of recycled things. When it comes to recycling, most of us toss what we think are usable items into the curbside cart, since it’s been drummed into everyone’s heads for decades. But as packaging and single-use plastics have proliferated, it’s become more complicated for facilities to sort recyclables they are actually able to recycle. And now overseas recyclers — in particular, China — are demanding better quality scrap with less garbage in it. That’s got local recycling facilities scrambling to comply. The bales, which might weigh a ton or more apiece, are trucked to the Port of Oakland and then shipped overseas, where recyclers in China and Southeast Asia remanufacture these materials into new products. Sometimes the contamination problem is subtle. Many people throw their pizza boxes into the recycling bin, but even a tiny grease spot can make the cardboard unsuitable for remanufacturing. Another pervasive problem is cardboard circled with shrink wrap plastic, and shipping boxes full of plastic pillow packing. People throw the whole thing in, rather than separating the plastic from the cardboard, not realizing the headaches that this causes for recycling center employees, who must separate these materials by hand. Although recyclers have accepted a certain amount of contamination in years past, that’s all changing, according to local recycling facility spokespeople. Few of us know what actually happens to recyclables after they’re picked up by our friendly neighborhood refuse hauler. The contents of our bins eventually end up at facilities for sorting, something that is partly automated and partly done by people. Automation has gotten better — just witness the brand-new high-tech materials recovery facility at the Monterey Regional Waste Management District in Marina, where sizing screens, density separators, optical scanners and heavy-duty magnets help sort recyclables — yet it can never be perfect. Figuring out how to provide cleaner recyclables is now the name of the game. Of course, recycling benefits the environment, but it’s also a huge global industry, as author Adam Minter explains in his book “Junkyard Planet: Travels in the Billion-Dollar Trash Trade.” “Recycling consumes fewer trees, digs fewer holes, and consumes less energy than manufacturing from virgin materials (a recycled beer can requires 92 percent less energy to manufacture than one made from virgin ore). To this end, those huge bales of paper, cardboard, metal and plastic assembled each week at the city of Santa Cruz and Monterey Regional facilities are commodities being bought and sold, mainly to overseas recyclers. The bales, which might weigh a ton or more apiece, are trucked to the Port of Oakland and then shipped overseas, where recyclers in China and Southeast Asia remanufacture these materials into new products. These days, waste management districts depend on selling recyclables, with money helping to bolster their budgets, and also helping them meet state-mandated recycling goals. Yet some commodities seem hardly worth the effort, as O’Malley points out — a bale of rigid plastic at the Santa Cruz facility was worth only $5. In January, China became much choosier about the amount of contamination that it would accept in certain types of solid waste. Before, according to Monterey Regional operations director Tim Brownell, Chinese recyclers would accept 5 percent contamination in baled cardboard. Now, the contamination rate cannot be greater than a half percent — an enormous change in what recyclers are requiring. And that’s a major difficulty for California, where cities and counties are mandated to reduce waste, with a variety of goals that must be met for coming years. By 2020, the state is requiring that 75 percent of refuse must be recycled, composted or otherwise reduced. Despite the best efforts by operators of recycling facilities to keep contaminants out the bales, it still happens. 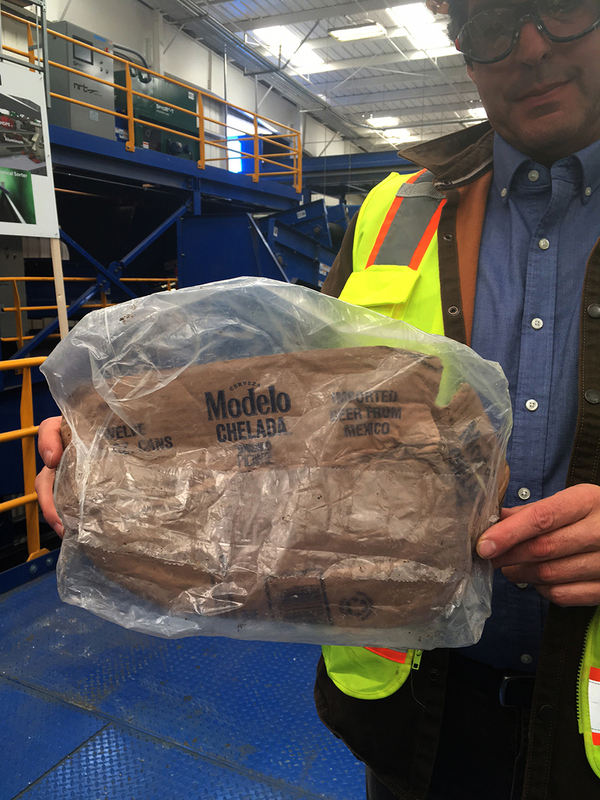 Brownell points out a plastic container lid embedded in a bale of cardboard — somehow it slipped past the sorters and all the whiz-bang equipment of Marina’s new facility. There is a great range of items meant to be used once and then thrown away: plastic straws, juice pouches, disposable razors, and hundreds of thousands more products that have trained us to trash them. Recycling is an age-old practice that has become more problematic in the modern age. In ancient times, rag pickers collected old clothing to be turned into manuscript paper, and Paul Revere famously bought up his neighbors’ scrap metal and melted it down for use in his blacksmith shop. During World War II, metal and paper drives were held and seen as an important part of the war effort at home. Contrast that with the 21st century, where Americans’ consumption has increased, elaborate packaging creates even more trash, and items become broken or obsolete more quickly. “Instead of conserving, recycling is now a way to manage our discards,” said O’Malley. Plastics are a particular problem. Made from petroleum byproducts and widely produced since the 1940s, they are more difficult to melt down and turn into other items because their polymers degrade in the process. Because there’s often not a big price difference between virgin and recycled material, manufacturers who need plastic often opt for virgin. Not all plastics are equally recyclable. It depends on how they’re made. Plastics marked #1 and #2 are the easiest to make into other things, while the others are more difficult — which is why haulers typically specify only placing those plastics in the recycling bin. Adding to the confusion is that recycling rules are subject to change, and vary from place to place. For instance, the City of Santa Cruz doesn’t accept shredded paper, but other cities around the Monterey Bay will, depending on the refuse company. But most people hate to waste, and want to help — hence the “wish-cycling.” And that’s how all kinds of unacceptable items get into the bins. And these days, new types of containers made with sandwiched materials pose additional concerns. O’Malley demonstrates with a snack can made with a plastic top, a metal bottom, and paperboard sides fused with a type of metal foil. It keeps your Pringles fresher, to be sure, but to recycle this would require someone to painstakingly pick it apart for the different components — not at all cost-effective. This is also the problem with recycling a lot of electronic waste, said Tim Brattan, executive director of Santa Cruz County-based Grey Bears, which takes in recyclables to help pay for its senior meal programs. “Look at plastic printers,” he said, many of which are cheap to buy. When printers don’t work as they should, most people tend to dump it and buy another one. Although printers can be taken apart and recycled for small amounts of precious metals they contain, there’s little money in doing so because of the labor involved, Brattan said. Rather than recycle, Grey Bears takes in broken printers and refurbishes them for resale or as giveaways to seniors in need. A modern and ubiquitous packaging material, polystyrene foam (known commonly as Styrofoam), is also difficult to recycle. It takes a special machine called a densifier, which Grey Bears happens to have, but most recycling facilities do not. “You can melt and reform it infinitely, and they use it in construction materials, trim molding and picture frames,” said Brattan. “It has great utility.” Unfortunately, polystyrene foam also lasts indefinitely in the environment, breaking down into small particles that ocean creatures might eat. And then there is a great range of items that are meant to be used once and then thrown away: plastic straws, juice pouches, disposable razors, and hundreds of thousands more products that have trained us to trash them. Back when curbside recycling programs were first introduced, there was not the range of materials there are now. Paper and cardboard went in one bin, metal cans in another, and glass in the third. Then came the advent of single-stream, or mixed recycling, in which all items could be placed into the same bin, to be hauled away and sorted at a recycling facility. 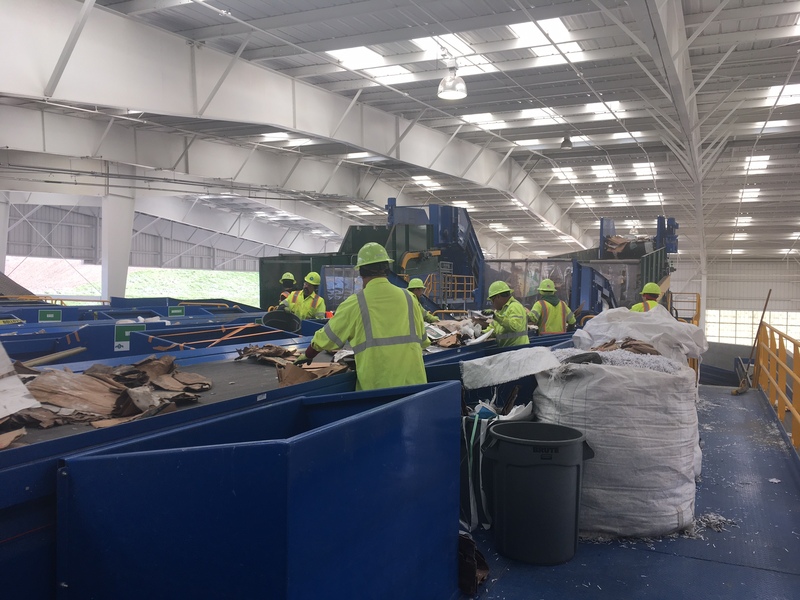 Single-stream recycling provided convenience for the customer and new problems for municipalities tasked with sorting the items. And that’s when contamination became more common, noted Lindenthal. Recycling agencies were also mandated by the state to divert a certain percentage of refuse from the landfills, and that’s when a wide variety of recycling programs began. Then there are things like old appliances going for scrap metal, and mattresses, which are now part of a new manufacturer-based program that takes all the components apart — wood frame, metal springs, foam padding — and recycles them. Both Monterey Regional and the City of Santa Cruz take part in the Bye Bye Mattress program, which is funded by fees that consumers in California pay when buying a mattress. Since it’s now free to dispose of mattresses at Marina and at the Santa Cruz Resource Recovery Facility, mattress dumping along roadways is becoming less common. Recycling agencies would like to see manufacturers take the lead in using responsible manufacturing and packaging — either developing similar programs, or to make items in a more environmentally friendly way. People need to think about reusing and reducing rather than recycling — and also to refuse what they don’t really need. For now, both the city of Santa Cruz and the Marina recycling facilities are concentrating on education efforts to clean up recycling. O’Malley is leading a new Master Recycler volunteer training program in which citizens attend an eight-week program and learn the fine points of recycling; the volunteers go out and spread the word at local events and in their neighborhoods. Terry Grove, a semi-retired speech therapist who lives part-time in Santa Cruz, was in that inaugural Master Recycler program and said she was amazed at how much she didn’t know about recycling before she took the classes. Now she thinks before she buys, wastes less food, and talks with friends and acquaintances about what she’s learned. “I also plan on contacting local markets and encouraging them to buy food items with minimal and easily compostable or recyclable packaging,” Grove said. Monterey Bay residents who have questions about what or how to recycle can now find help through some new resources. On Earth Day, April 22, the Marina recycling facility is launching a new app called What Goes Where, which Lindenthal said is an easy way to find out what items can be recycled and where they can be taken in Monterey County. “It’s a one-stop resource to quickly determine what to do with things,” said Lindenthal. In Santa Cruz, people can take advantage of a new online recycling guide at www.cityofsantacruz.com/recycleright, and also participate in some other refuse-diverting activities, including the citywide Garage Sale Weekend June 2-3 and the Donate, Don’t Dump campaign aimed at local college students. At the end of the day, says Grove, people need to think about reusing and reducing rather than recycling — and also to refuse what they don’t really need. O’Malley and Lindenthal both said there’s a great need to educate people on the proper way to recycle at the curbside — keep things dry, clean, and stick to only the items that are allowed — as well as to urge them to reduce and reuse, rather than recycle, whenever possible. People can also choose to buy items that are made with recycled, rather than virgin materials. “There’s a lot of work to be done in closing the loop,” said Lindenthal.